We take a look at the interim financial results of Bidcorp for the period ending December 2018. So what has the trading environment been like for the food services group, that trades as Bidfood in most countries? Bid Corporation Limited known as Bidcorp separated from Bidvest and listed on the JSE on Monday May 30 2016. The unbundling provides Bidvest shareholders with the opportunity to participate directly in Bidcorp’s foodservice operations, as well as enabling each of the businesses to achieve their respective strategic goals. Bidcorp will focus on realising the potential that exists in its current foodservice operations as well as acquisitive growth opportunities. Bidcorp is an international broad-line foodservice group, listed on the JSE, South Africa, and present in developed and developing economies in five continents. Focused on foodservice, the business comprises a mix of well-established leading and rapidly growing market positions, offering significant future upside. The profile of the customer base is strategically targeted to fully service the foodservice industry’s needs. Bidcorp is a broadline foodservice group with a geographic reach encompassing over 34 countries on five continents. Bidcorp, operating as Bidfood in most geographies, has adopted a decentralised model of management which encourages the entrepreneurial spirit contained in each of its businesses. Each business is directly responsible for its product range, its buying and sales approach. Businesses in the different regions retain their local brand, tone of voice, look and feel specific to local culture. Just like a truly great dish, a dynamic and successful foodservice partnership requires the right ingredients. As a leading distributor to the foodservice industry, Bidfood has come to understand this particular recipe intimately. It involves maintaining a balance between leading edge innovation and a consistent, reliable delivery of “the classics”. We offer a wide selection of local and internationally sourced products that have been tailored to suit all customer types – large and small. We believe that the key ingredients Bidfood brings together create a robust and forward looking framework for us to deliver the reliability, support and inspiration our customers have come to expect. Strong trading profit growth in the more developed markets. Seems to be really struggling in the emerging markets. Bidcorp's performance overall was in line with management expectations, considering the differing economic realities of its developed and emerging market exposures. Headline earnings per share (HEPS) increased by 9,2% to 700,2 cents per share (H1F2018: 641,0 cents), with basic earnings per share (EPS) increasing by 8,2% to 698,7 cents per share (H1F2018: 645,5 cents). Currency volatility across major currencies positively impacted our rand-translated results for the period. On a constant currency basis, HEPS grew by 7,1%. Trading across developed market geographies remained positive, despite cost pressures, persistent low food inflation and moderate economic growth. Good top-line growth combined with gross-margin gains alleviated cost inflation. Europe again delivered a standout performance, particularly eastern Europe. UK Foodservice continued to perform very well and Bidfresh continued on its recovery trajectory. Australia benefited from its previous infrastructure investments while continuing to rationalise its exposure to lower-margin customers. New Zealand achieved both top-line and margin growth, offsetting cost pressures. South Africa performed admirably, despite tough economic conditions. Greater China struggled, hampered by the after-effects of the loss of a major dairy products agency and dairy market crisis, which constrained gross margins and added costs as rapid range diversification proceeded. Consequent to our previously announced strategy of exiting the UK Contract Distribution activities, Bidcorp has classified all of its UK Logistics' activities as discontinued, the details of which are reported below. Performance significantly improved on the second half of F2018, though the business still recorded a small loss. Service levels have improved and customer pricing has been substantially increased to more fully reflect the risk and reward of these activities. Bidcorp continues to run a broad sales process designed to achieve a controlled exit of this business. PCL distribution business (PCL) Trading in PCL (dairy distribution business for Arla) was poor and losses were incurred. Despite improved service levels, profitability was significantly impacted by low revenue increases, higher distribution costs and a dispute on transport rates. As noted previously, the business relationship with Arla has largely broken down and negotiations for the sale of the major portion of these activities is underway. Accordingly, the intangible associated with this contract has been fully impaired and further costs associated with the exit will be incurred in the second half particularly vehicle fleet disposal costs. Bidcorp remains focused on growth opportunities in the wholesaling of food and allied products to the eat-out-of-home market; organically through achieving the appropriate customer mix, by selling more products and gaining new customers; via in-territory bolt-on acquisitions to expand our geographic reach or to expand our product ranges; and via strategic acquisitions to enter new markets, as and when these arise. Our mantra of "it's all about the food, the service and the technology" articulates our aim of delivering customer satisfaction backed by high service levels, efficient infrastructure and fit-for-purpose cost-effective products. Fresh produce, meat, value-add processing and supply chain procurement initiatives all remain areas of further potential across all businesses in the Group. Our bespoke global ecommerce and CRM platform continues to evolve and embrace our best worldwide intellectual property, all leveraged for the greater benefit of the Group. Our service capability continues to improve as we further invest in our decentralised infrastructure programme to fulfil the strategic objective of getting as close as possible to the customer base. Shared innovations across the Group greatly enhance our speed of business development. We retain significant financial headroom to enable us to decisively capitalise on the right opportunities, either organic or acquisitive, while always remaining disciplined in our overriding approach. Financially, the Group is strong and we expect cash generation to remain robust. Our objective is to generate above-average returns in each of our businesses in their home markets, notwithstanding macro-considerations and short-term volatility in various markets. Bidcorp's strength lies in the experience of its entrepreneurial management teams who thrive within our decentralised Group culture. Despite some short-term challenges in our emerging markets, the fundamental demographic and industry drivers of our global foodservice markets remain positive, positioning the Group to continue to deliver real earnings growth for the full year. 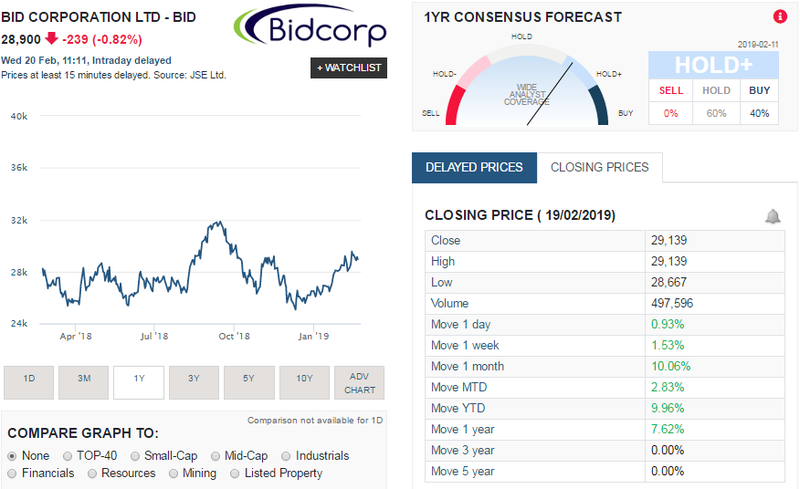 The screenshot of Bidcorp share price performance taken from Sharenet below shows that BID has been moving gradually higher but has not exactly shot the lights out for their shareholders.